one came in last night so i snagged the keys and ive been playing with it off and on all morning. its actually a pretty neat little car and has more room up front than i thought it would. has some really cool design cues and great fit and finish. ill post a full review with my findings as the day goes on. it is NOT what i expected it to be like. its basically a CT replacement, however kicks the crap out of the CT in every way imaginable, better power better handling, actually feels like a real lexus. I sat in one at the LA auto show (i'll post some photos later) and I like it overall but was a bit disappointed in the interior. it's lower quality in person than Lexus leads on in its promotion photos. Overall looks really budget and plasticky. 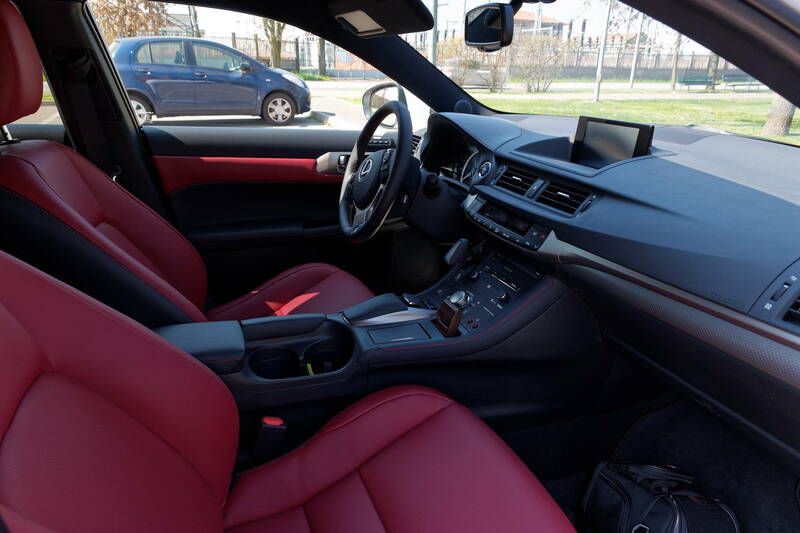 Maybe the red interior one is nicer? I think the CT is a notch above in actual materials and fit and finish interior wise. Some of the touches in the UX were nice but those plastics man they just seemed very thin and hollow and cheap. The steering wheel was very nice. Overall though I like it and it's fantastic that it gets 38mpg and is a crossover. Definitely post some shots up. ^^^ Yeah, not convinced either it's better than the CT (owned one). Rear door panels are hard plastic (as with the CT's) and the lower dash and door panels have similar so-so hard plastic. OP, looking forward to your full review and please post pics! The CT interior has aged really well. It's not the nicest interior by any stretch but very nice quality fit and finish. Particularly the dash and the seats. Mine is wearing very nicely (as it not wearing at all) it's literally like new. No wear or shiny finish. Has a dry/matte finish. Very impressed. The door panels on the CT are decent to nice. I don't like the large silver portions around the handle pull, they look kind of cheap. i hope to do something with those some day. paint them maybe. I have a 2016 F-Sport CT and I also had a 2014 F-Sport IS 300h and I can say that coming from the more refined IS down to the older and cheaper CT wasn't traumatic at all. Overall the CT in my opinion has the best interior of the segment, speaking only about quality/fit and finish, and even if it has some cheap parts (I never liked the buttons for the power windows and the others in that area) it's still a very pleasant car to be inside. - the front door panels that completely lacks a fake leather covered portion apart from the area where you rest your arm. Overall I'm pleased by what I see here but I'm still not happy that I'm under the impression that this car looks cheaper inside - to my eyes - than my CT which costs 10.000€ less. Last edited by SadmanISHF; 12-13-18 at 05:47 PM.